Large shrubby plants with great big spikes of flowers up to 2 feet long. Will burst with an abundance of pink, purple and white blooms all summer long. Ideal for hot sunny spots, these are great plants for climbing up walls and trellises - you can also prune them to grow in pots on the patio. Incredibly vigorous and easy to grow. Supplied as 3 mature plants in 9cm pots. These beautiful Lavatera are one of THE products that every garden should have! 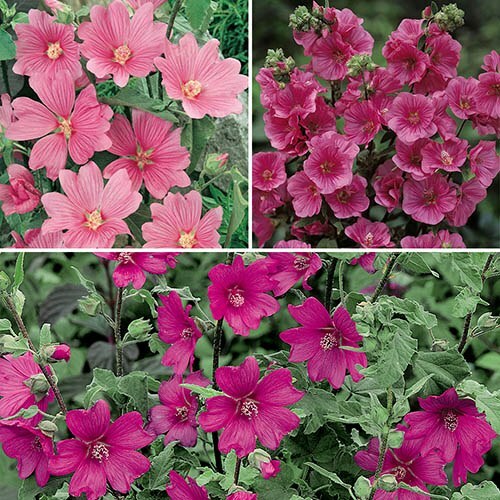 Lavatera are large shrubby plants with great big spikes of flowers up to 2 feet long, which will burst with an abundance of pink, purple and white blooms all summer long. Ideal for hot sunny spots, these are great plants for climbing up walls and trellises. You can also prune them to grow in pots on the patio. Incredibly vigorous, these are some of the easiest plants to grow perfect for beginners!